Mayon Volcano, also known as Mount Mayon, is an active volcano in the province of Albay, on the island of Luzon in the Philippines. 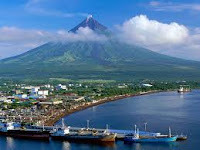 Renowned as the "perfect cone" because of its almost symmetric conical shape, Mayon forms the northern boundary of Legazpi City, the largest city in terms of population in the Bicol Region. The mountain is a national park and a protected landscape in the country proclaimed as as Mayon Volcano Natural Park in the year 2000. Local folklore refers to the volcano as Bulkang Magayon (Bikol: 'Beautiful Volcano'), after the legendary heroine Daragang Magayon (Bikol: 'Beautiful Lady'). Mayon Volcano is the main landmark of Albay Province, Philippines, rising 2,462 metres (8,077 ft) from the shores of the Gulf of Albay about 10 kilometres (6.2 mi) away. 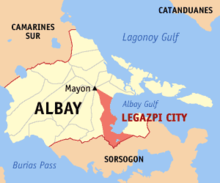 The volcano is geographically shared by the cities and municipalities of Legazpi City, Daraga, Camalig, Guinobatan, Ligao City, Tabaco City, Malilipot, and Santo Domingo (clockwise from Legazpi) which divide the cone like slices of a pie when viewed from above. with the facade still standing. 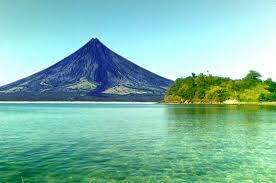 Mayon is a classic stratovolcano type of volcano capped by a small central summit crater. The cone is considered to be the world's most perfectly-formed volcano for its symmetry, which was formed through layers of pyroclastic and lava flows from past eruptions and erosion. The upper slopes of the basaltic-andesitic volcano are steep averaging 35-40 degrees. Like other volcanoes located around Pacific Ocean, Mayon is part of the Pacific Ring of Fire. It is located on the eastern side of Luzon, near the Philippine Trench which is the convergent boundary where the Philippine Sea Plate is driven under the Philippine Mobile Belt. When a continental plate or belt of continental fragments meets an oceanic plate, the lighter continental material overrides the oceanic plate, forcing it down into the Earth's mantle. Magma may be forced through weaknesses in the continental crust caused by the collision of the tectonic plates. One such exit point is Mayon. Mayon is the most active volcano in the Philippines having erupted over 49 times in the past 400 years. The first record of a major eruption was witnessed in February 1616 by Dutch explorer Joris van Spilbergen who recorded it on his log in his circumnavigation trip around the world. An old photograph of the Cagsawa ruins with the facade still standing. The church was largely destroyed during the 1814 eruption of Mayon. The most destructive eruption of Mayon occurred on February 1, 1814. Lava flowed but not as much compared to the 1766 eruption. Instead, the volcano was belching dark ash and eventually bombarding the town with tephra that buried the town of Cagsawa. Trees were burned; rivers were certainly damaged. Proximate areas were also devastated by the eruption with ash accumulating to 9 m (30 ft) in depth. 2,200 Albay locals perished in what is considered to be the most lethal eruption in Mayon's history. The eruption is believed to have contributed to the accumulation of atmospheric ash, capped off by the catastrophic eruption of Mount Tambora in 1815, that led to the Year Without a Summer in 1816. Mayon Volcano's longest uninterrupted eruption occurred on June 23, 1897 which lasted for seven days of raining fire. Lava once again flowed down to civilization. Seven miles eastward, the village of Bacacay was buried 15 m (49 ft) beneath the lava. In Libon 100 people were declared dead—incinerated by steam and falling debris or hot rocks. Other villages like San Roque, Misericordia and Santo Niño became deathtraps. Ash was carried in black clouds as far as 160 km (100 mi) from the catastrophic event, which killed more than 400 people. At night the scene was truly magnificent and unique. At the date of my visit the volcano had poured out...a stream of lava on the Legaspi side from the very summit. The viscid mass bubbled quietly but grandly, and overran the border of the crater, descending several hundred feet in a glowing wave, like red-hot iron. Gradually, fading as the upper surface cooled, it changed to a thousand sparkling rills among the crevices, and, as it passed beyond the line of complete vision behind the woods near the base, the fires twinkled like stars, or the scintillions of a dying conflagration. More than half of the mountain height was thus illuminated. No casualties were recorded from the 1984 eruption after more than 73,000 people were evacuated from the danger zones as recommended by PHIVOLCS scientists. But in 1993, pyroclastic flows killed 77 people, mainly farmers, during the eruption. Its 48th and latest major eruption was a quiet effusion of lava on July 14, 2006, which was aggravated when a lahar caused by the rains of Typhoon Durian followed on November 30, 2006. A further summit eruption occurred on August 10, 2008. Starting in January 2011, the volcano is weakly erupting and may be building up to a larger hazardous eruption.